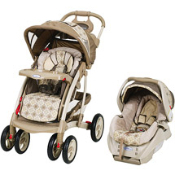 Our travel system offers stylish looks and feature friendly designs. The travel system includes stroller with one hand fold down, infant car seat and convenient stay in the car base. Infants up to 22 pounds and 29 inches. Colors and styles may vary.